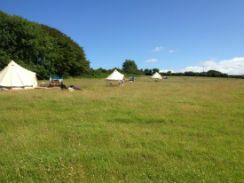 Sloeberry Farm’s glamping in Cardigan Bay Wales canvas lodges and bell tents are nestled in 13 acres of pasture & woods, only 3 miles from the fishing village and stunning beaches of Aberporth. Just a short drive from the historic town of Cardigan. Sit back. Put your feet up. Pour a glass of wine. Watch the sun set over the hills and glint off the lake. 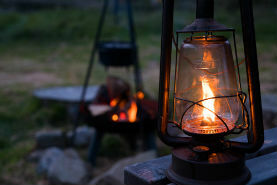 Enjoy time as a family exploring, finding hidden streams or relaxing by your campfire. Wake up to the sounds of bird song. Enjoy an invigorating cup of freshly ground coffee. Head off and create lasting memories to take home. After a long day exploring the area or walking by the coast our lodges are designed to be the perfect base to come back to, sit back, relax and take in the sunset across the lake. 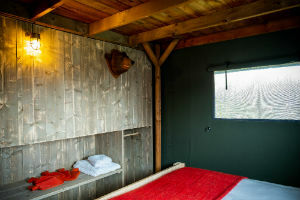 Sleeping, our three lodges sleep seven or eight people some with private fresh water wood fired hot tub. All lodges have a kingsize master bedroom and a double cabin bed for those that want to hideaway, Owl Lodge has 4 single beds on an upstairs level and our other lodges have a bunkbed room downstairs sleeping three. 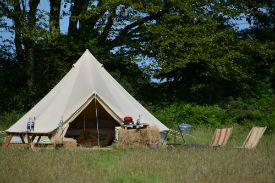 All with proper beds made up with luxurious bed linen, super warm duvets and cosy blankets. Everyone will be lulled to sleep by the sounds of the otter brook burbling past. Next to the bedrooms is shower room and separate en-suite wash room, with flushing toilet and basin. Cooking The kitchen is fully equipped with everything you should need including a gas hob, sink, cooking utensils, pots, pans, crockery, cutlery and glassware. Across from the kitchen area is a full size dining table perfect for those long meals stretching into the evening. 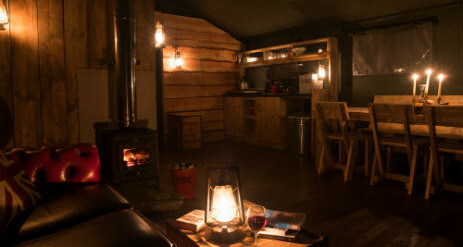 Relaxing At the heart of the lodge is our wood burning stove, surrounded by vintage leather chesterfields: it will keep the lodge warm in all weathers and is the perfect spot to finish the evening. 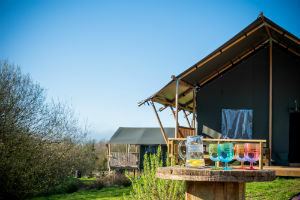 Outside Each lodge has its own large deck area at the front with stunning views across the coastal hills, where better to sit with a glass of wine and a book on a summer afternoon On the grass is a picnic table, BBQ and firepit what better spot sit by a crackling log fire whilst gazing at the stars across the immense west wales night sky. 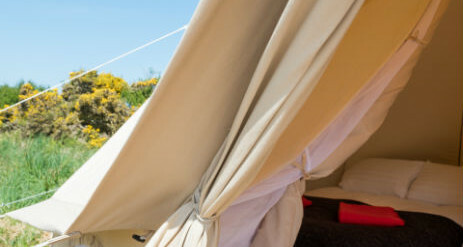 The traditional bell tents provide luxurious camping with real mattresses (not airbeds), high-quality linens and coir floor matting. 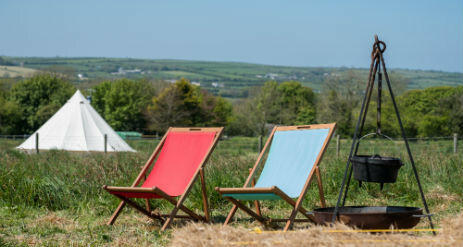 Bell tents are cosy when zipped in and blankets are provided for colder nights or for sitting wrapped up by the fire in front of a glass of wine. 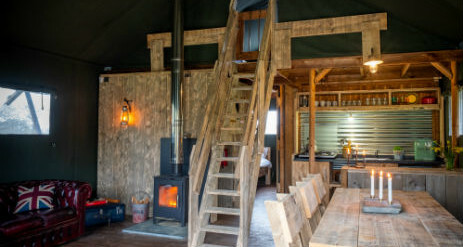 Tents accommodate up to four people and come fully-equipped with high-quality cooking equipment as well as a firepit, perfect for cooking or barbecuing your dinner. 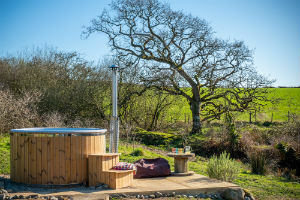 At the bottom of the meadow are modern toilets and hot gas-powered showers, each hidden in a traditional-style hut built by a local craftsman. The Location Sloeberry Farm is located at Crynga Mawr near Cardigan in West Wales. The farm was founded in the early 1800’s to make use of the natural spring to power a mill and dairy. Its sits in a sheltered spot with stunning views across the countryside, a private lake and lots of nooks and crannys to explore. 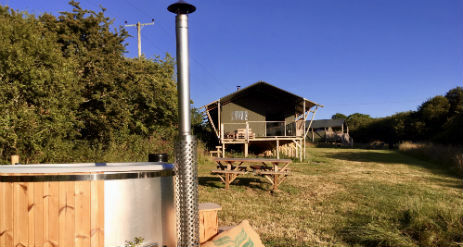 Everyone is free to roam around the farm and discover areas hidden away for private picnics or just sit around the lodge and soak up the sun. Local paths and country lanes lead down to Aberporth beach for a walk along the coast to local pubs in set spectacular coves. 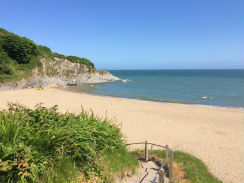 The Cardigan Bay area was voted by lonely planet as best place to be in the world right now, its absolutely stunning with cliff walks, sandy bays, pristine national trust beaches and small fishing villages. Cardigan town is a short drive away and has an abundance of local shops, artisan bakers, pizza makers and award winning restaurants. The area is famed for outdoor pursuits such as coasteering, surfing, sea kayaking, sailing, mountain biking and walking; its known as the best location in the UK to spot dolphins, puffins and rare wildlife. 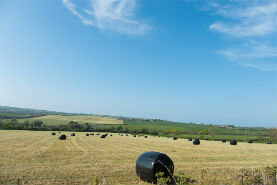 Everyone is free to roam around the farm and discover areas hid away; perfect for private picnics. 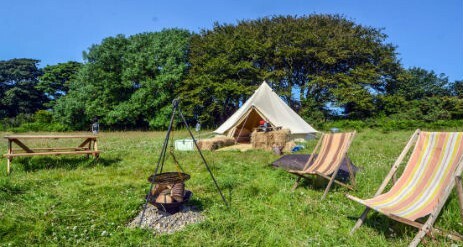 Alternatively, just sit around the tent and soak up the sun. 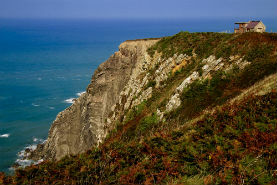 Local paths and country lanes lead down to Aberporth with its beaches, pubs and restaurants.